Talk to people. In order to generate the greatest ‘buzz’ about paintballing, we found that it really helps to talk to as many people as possible. Party animals. 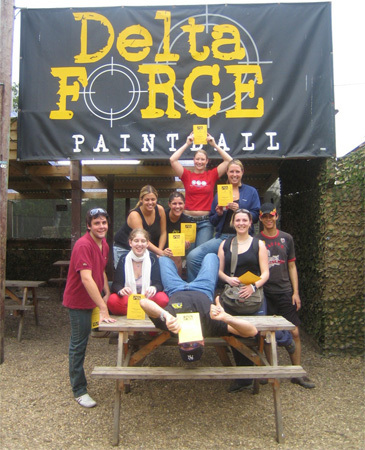 In most circles of friends and workplaces there are a few known ‘livewires’ – people with magnetic personalities that are always up for anything – get these people involved in creating some excitement for the day of paintball. Posters. Put them up on your notice board at work. Texts. Send out some texts and ask people to pass it on to other people that might be interested in a day of outdoor adventure. Emails. Just like texts, everyone has an email address and it is a great way to spread some of the excitement and organise your paintball event. ‘maybes’ – no matter what they say! Deadline. Set an early deadline by which people have to have paid you their deposit (you can always extend it a bit). If people commit early then they are less likely to drop out due to other commitments. Choice of date. We can always change the date of the event if you find that lots of people can’t make the date you have set. Fun. Let everyone know how much fun this is going to be. Friendships are forged ‘under fire’, heroes (and cowards) will emerge and you and all of your mates will be talking about it for months to come. Organising a paintball event is as easy as that, so gather your friends, organise your work colleagues, tell your family and call 1300 850 744 to get the ball rolling!